Two tanzanite gemstones equal double the beauty in this Apples of Gold creation. 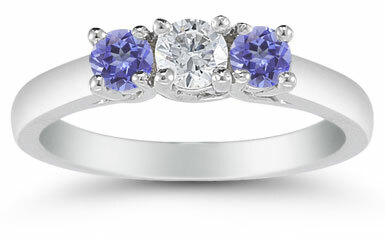 Styled with the classic three stone combination, this ring also brings a chic flair with the lovely purple-colored stones. The two tanzanite gems measure 3.5mm and sit opposite the exquisite 0.25 carat white diamond. Each of the round cut stones sparkle effortlessly as they rest in the white gold, four prong setting. A polished white gold band helps keep the three stone ring in up-to-the-minute fashion. Also available in 14K Yellow Gold (shown below), Gold or Platinum by request. 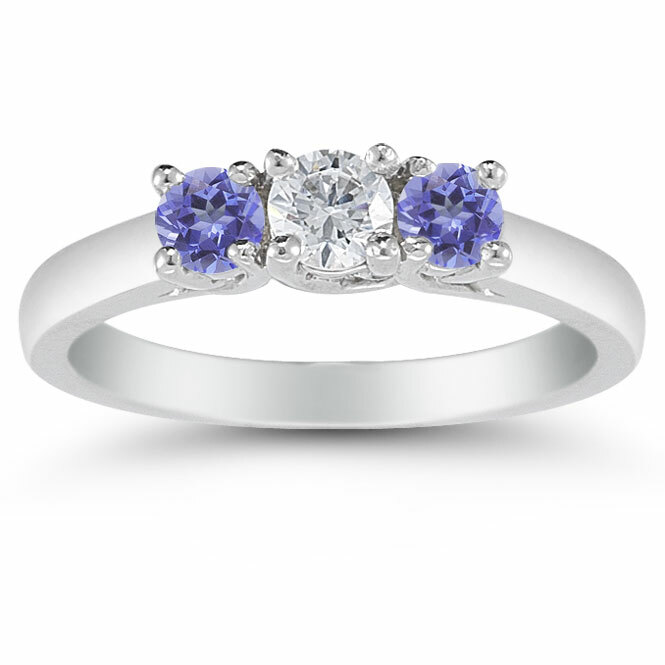 We guarantee our Three Stone Diamond and Tanzanite Ring, 14K White Gold to be high quality, authentic jewelry, as described above.